BEHIND SAINTSStanley marks 40 metres out and will kick it after the siren. He sends his kick on its way and it fades to the right for a behind. GOAL BULLDOGSCrameri runs inside 50. He is running out of room and has nothing to kick to so he tries the checkside and he kicks his third goal. Good kick! GOAL BULLDOGSA cruel blow for the Saints and one that also seals their fate. A Shane Warne like spin on the footy bounces straight to Darley who drags it back and kicks the goal. BEHIND BULLDOGSTime to steady the ship with Hunter marking. His shot for goal looks good off the boot but fades late. GOAL SAINTSBillings with a hurried right foot snap and that's a massive goal. Saints coming home with a wet sail. IT WAS the Lenny Hayes tribute game, with banners, placards, music and even a gate at Etihad Stadium dedicated to the St Kilda champion. However, although all of the pre-match attention focused on a retiring veteran, it was an emerging star who stole the show. Jake Stringer, we presume, missed the Lenny memo. 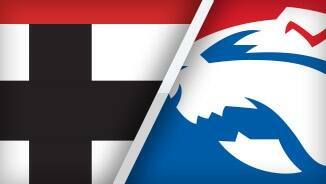 The Western Bulldogs were too good for St Kilda on Sunday, winning by 23 points in a 18.14 (122) to 15.9 (99) victory. 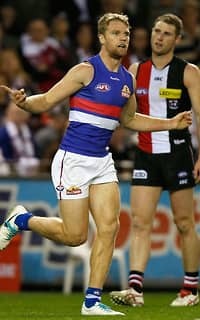 And Stringer, in his second season with the Dogs, was central to it, proving while Hayes was a star of the past decade, Stringer will likely feature heavily in the next. 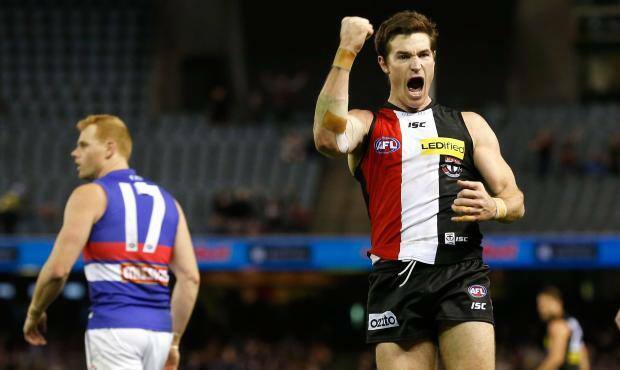 Two rounds after kicking five goals in a breakout game against Essendon, the 20-year-old backed it up with four goals and several game-breaking moments. His first half consisted of three goals, two of which will join his already growing highlights reel. One came in the first term, when he cut through two Saints players, bounced twice and dribbled through a curling kick. In the second quarter, with the ball on the boundary line, he kept it in through sheer force, got out of trouble, took a couple of steps and check-sided the goal, another effort showcasing his unique talent. Playing as a deep forward, Stringer was too nimble, quick and agile for whoever the Saints threw at him. 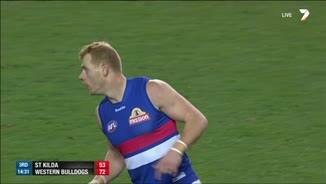 He was aided by plenty of good supply in one of the Bulldogs' slickest showings of the season. After being managed through recent weeks, Adam Cooney put in a stellar game, with 25 disposals and three goals. The Brownlow medallist looked fresh and fit, which was reflected in perhaps his best game of the season. Shaun Higgins added some class with 26 disposals, while Ryan Griffen (20) and Stewart Crameri (20 and three goals) also worked into the game. The Saints tried hard but were outclassed. David Armitage and Leigh Montagna offered some midfield drive, while James Gwilt, after a horror first half, moved forward to kick three goals from 20 disposals and eight marks. Hayes had a relatively quiet day, finishing with 17 disposals, each cheered loudly. 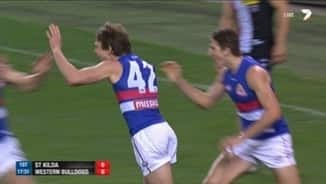 But he did kick a goal – to a standing ovation of the St Kilda crowd – and produced a famous sidestep in the final term to get past Jack Macrae, himself a handy if not younger exponent of the baulk. The first quarter, where the Bulldogs opened a 27-point lead, proved costly. The Dogs' 7.4 (46) was their highest-scoring first quarter of the season and it left the Saints chasing throughout the contest. 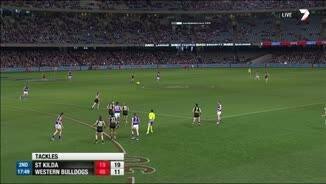 In the second term, Alan Richardson's men closed down the Dogs' run through the centre of the ground and got going themselves, cutting the margin to 20 points. "We played some really good footy today and so did they, so it was a good day but it had its challenges," Bulldogs coach Brendan McCartney said. "They were quite emotional as a club, the crowd was involved and the players were involved and we got a good start which was really good. We got four points, we don't do that every week, so we've got to enjoy it while it's there." 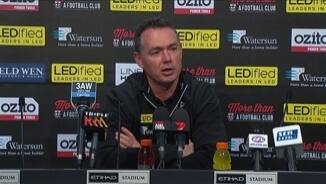 "We got smashed at the centre bounce in the first quarter," Richardson said. 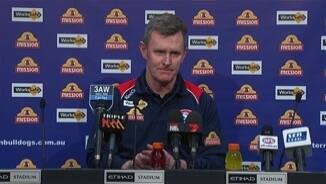 "That was really disappointing but to their credit they did something about it as a group. "We know that the Bulldogs are a very good contested ball team, they've got some enormous talent in there and that was always going to be a challenge so it was good the guys were able to dig in and do something about it." 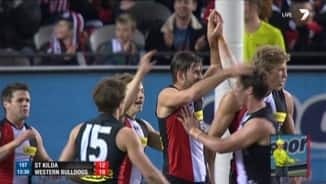 The Saints kept chipping away, even when the Bulldogs led by more than five goals, and got within 11 points with four minutes to play. 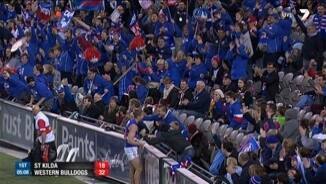 The Bulldogs settled themselves and kicked the two goals the Saints wanted so badly to close the contest.